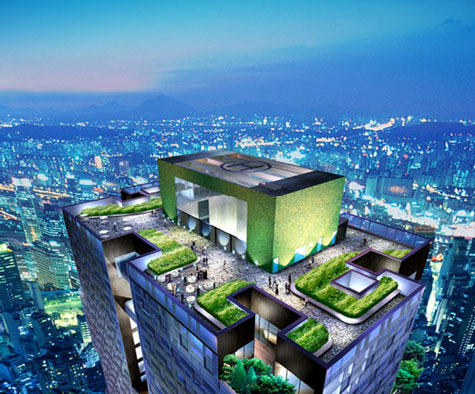 I've mentioned architect Minsuk Cho, of Mass Studies, on BLDGBLOG before: he designed the so-called "ring dome" for the Storefront for Art and Architecture's Z-A event last month in New York City, and he collaborated with Jeffrey Inaba's SCI-FI studio to propose an "urban district above the water" in Seoul. 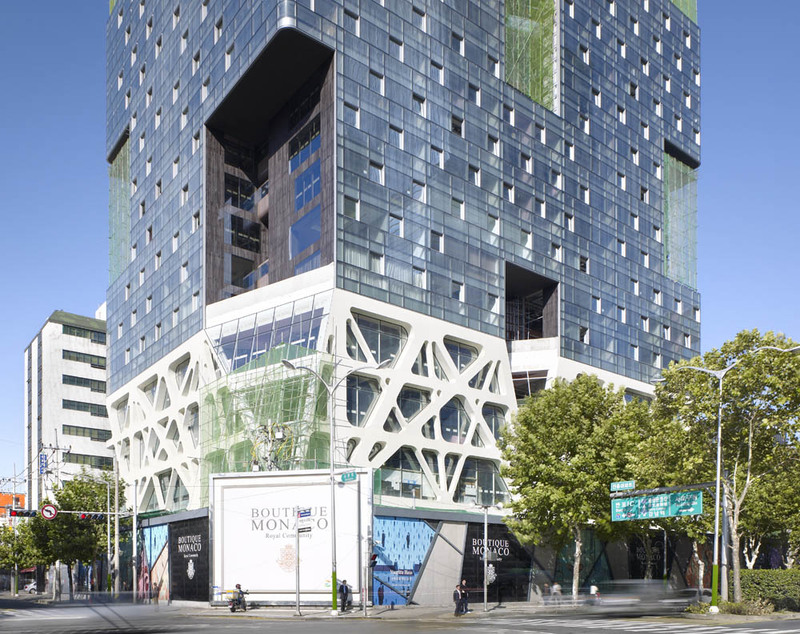 I'd say that Mass Studies is hard to beat for sheer spatial interest and originality; witness their Torque House, Pixel House, or Cheongam Media Headquarters, for instance – let alone the famously freaky Seoul Commune 2026. 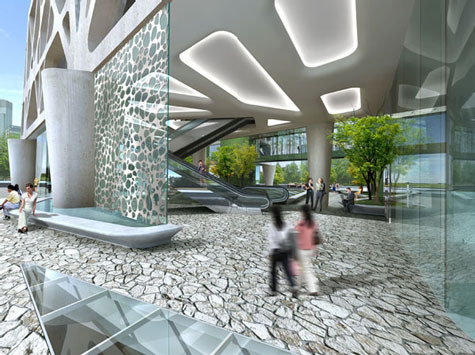 [Images: Three rendered views of the building's lobby and ground level exterior]. 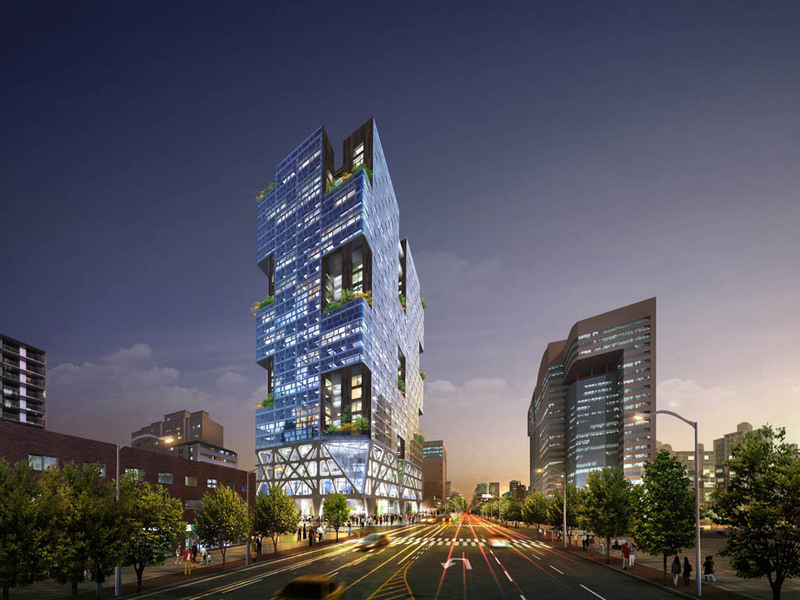 The Monaco is "a high-density, massive building for residential/office/commercial/cultural activities to be located in the heart of the Seoul metropolitan life, the area around Gangnam station." 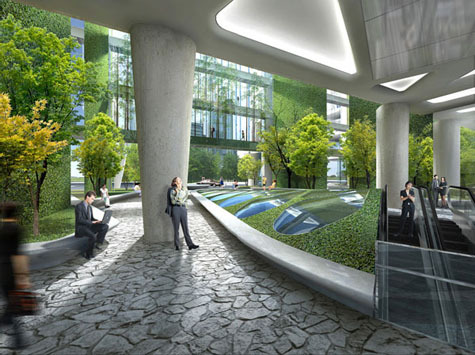 [Images: Day and night renders of the project's exterior, complete with punctuated vertical bays of greenery and residential terracing; view both the top and bottom images larger]. 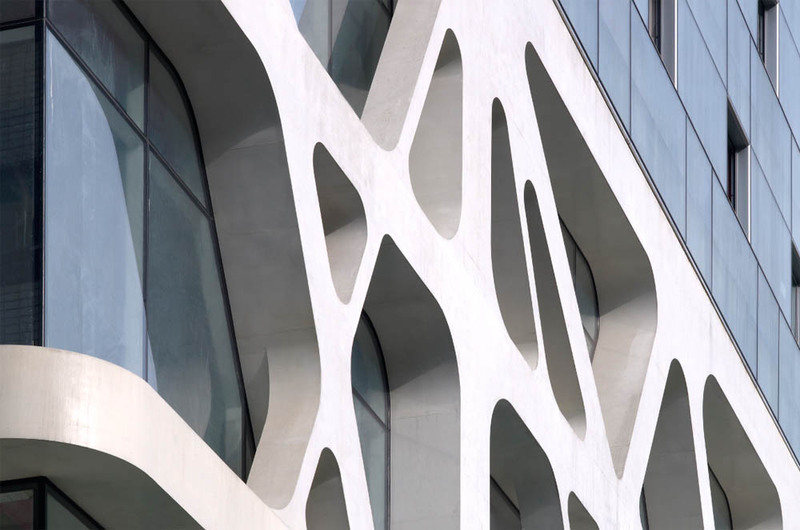 Further: "In the plan for Boutique Monaco, around 172 units are created in 49 different types and sizes and interconnected as if in an enormous puzzle. 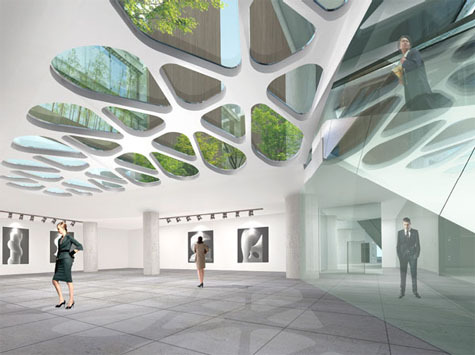 At the same time, different types of internal/external, private/public areas are to be installed." You can see some of the building's floorplans here. 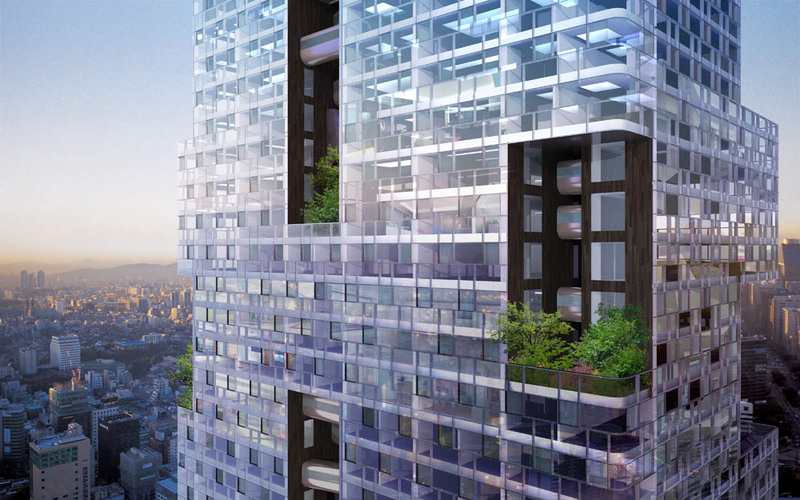 Meanwhile, I don't mean to uncritically promote the actions of a property developer in Seoul; nor do I wish to suggest that because this building has a few trees growing out of it that it's "green." But I do have to say that I like 1) the project's use of materials (the wood cladding inside the vegetated nooks is especially brilliant), 2) the punctuated bays themselves, which break up the facade in a really great way and add a spatially and experientially inspired dimension to the project, and 3) the diagonal bracing, however ornamental and non-structural it may be, of the podium. We may be seeing more and more of these sorts of structural weavings – but that's because they're cool. However, is not the transition between the base and the column or shaft, if you will, a bit sudden and grating perhaps, especially for such an "advanced" project of the 21st Century? - It seems as if Mass Studios wished to first burden themselves with something like the Hearst building before proceeding to the normal task of making a high-rise. 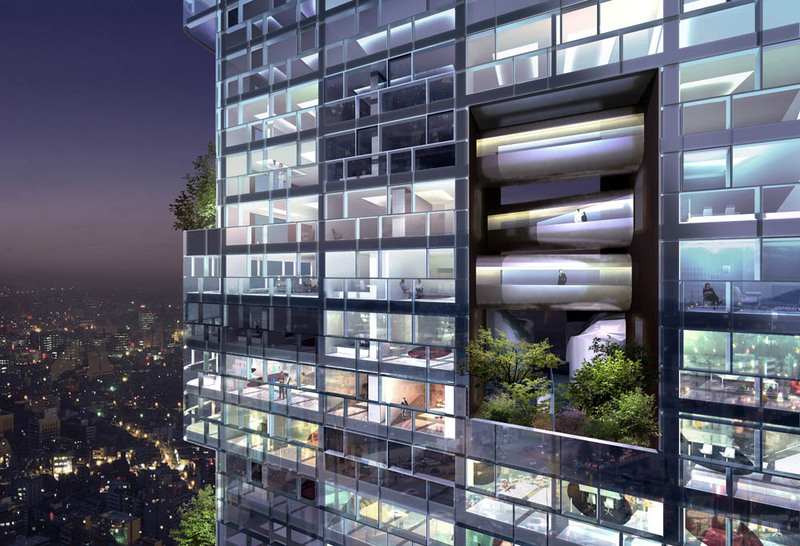 I am not against a differentiated base per se, but what is the logic of: four floors base, before 50 shaft, etc.? Executing a scheme in which floors transition from a pure "base" at the ground to a pure "shaft" later/above in a different manner such as: 1 floor base, 1 floor 80% base, 1 70% base, 50% base, 30% base -70 shaft, et al. seems as if it would give us more of the benefits of design, even peace. I am for, without inhibitions, individuation of windows or the elaboration of edificial iconography, and understand the constraint of cost on this, but why design this to such a rudimentary extent in such a simple way still, when, as designers, we can push for more? Why not create a coherent conglomerate of systems (structure, skin) as opposed to two distinct apparati, merely bolted to each other?